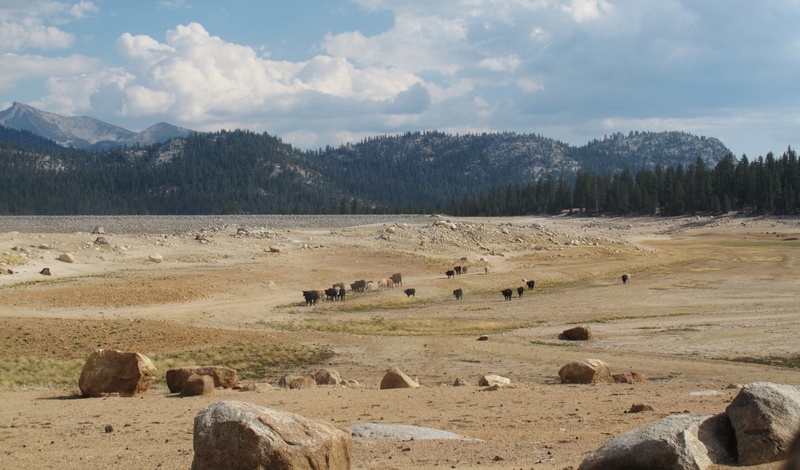 Cattle beat a dusty path through the bed of nearly dry Edison Lake, a Southern California Edison Company reservoir behind Vermillion Valley Dam, on September 15. The National Weather Service’s Climate Prediction Center is predicting “neutral” sea surface temperature conditions in the equatorial Pacific into the coming winter and that has translated into long-term climate outlooks for California that currently show “equal chances” of wet or dry conditions between now and May. Warmer than average sea surface temperatures would create a La Niño condition, a pattern that often (but not always) results in above-average amounts of precipitation over Central and Southern California. By contrast, a La Niña pattern, featuring below-normal Golden State precipitation, typically results in a dry scenario. Potential for the latter situation would be bad news in the central and southern San Joaquin Valley where water supplies have been diminished significantly by back-to-back drought years. What finally results will be a product of storm activity that could begin in early fall but normally increases throughout November, December, January, February and the early spring months. Last winter, November and December storms were potent and generous, briefly leading to expectations of a wet winter. Those hopes dried out quickly when the storm door swung shut in January and remained locked fairly firmly through springtime. There is no question what a third consecutive drought year would mean in the valley. During an August 30 farm forum hosted by the Fresno Grizzlies, it was noted repeatedly that water supply reductions are felt well beyond normal water uses. Economic damage is already being inflicted, particularly on the valley’s West Side where the declared San Luis Unit supply this year was 20%, due to crop curtailments, layoffs and reduced sales for support businesses and industries. There have been projections that even with an average natural supply next year, the West Side’s allocation from the U.S. Bureau of Reclamation might be zero.